I started knitting a hat in the car on the way home from Cleveland today. I'm calling it the car hat. For a while it was the ride home from Cleveland ignoring my son who is having a fit in the back seat hat. But car hat is easier to say. I'm not done yet, but a good portion of it is finished. I'm not sure who I'm knitting the hat for. Myself, Mr. H., Baby H., one of the kids, who knows. It's a hat. It's a cute hat. 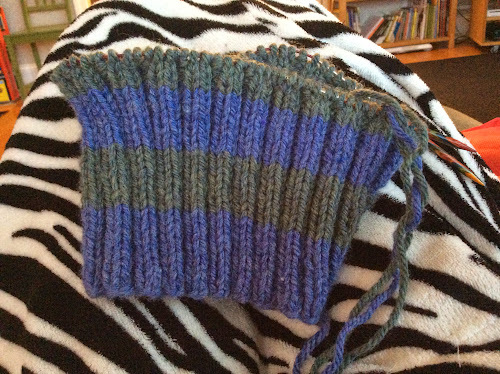 It's a hat that has stripes because I have all this different yarn that I am finding different things to knit with. But at the end of the day, it's a hat. And hats are wonderful things.